If you love strawberry donuts, this is the recipe for you! 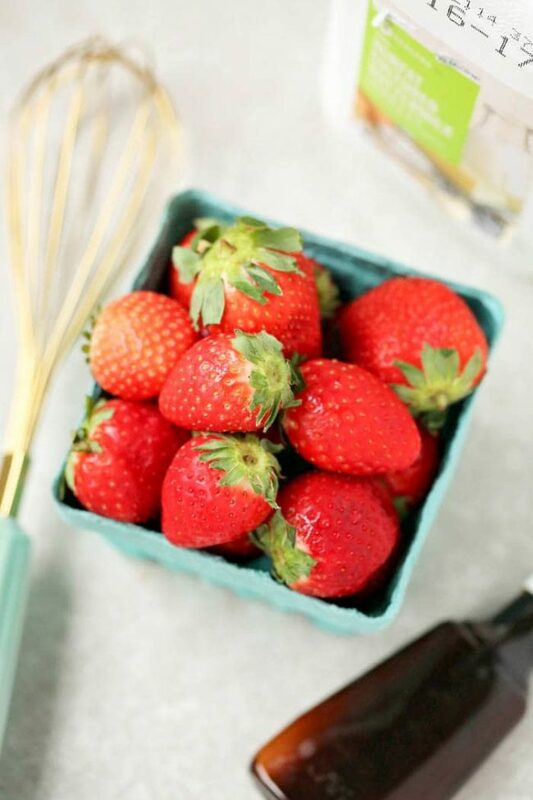 You won’t find a homemade recipe with a better strawberry taste! Watch us make the recipe in this quick 1-minute video, or read on to view the full recipe below. 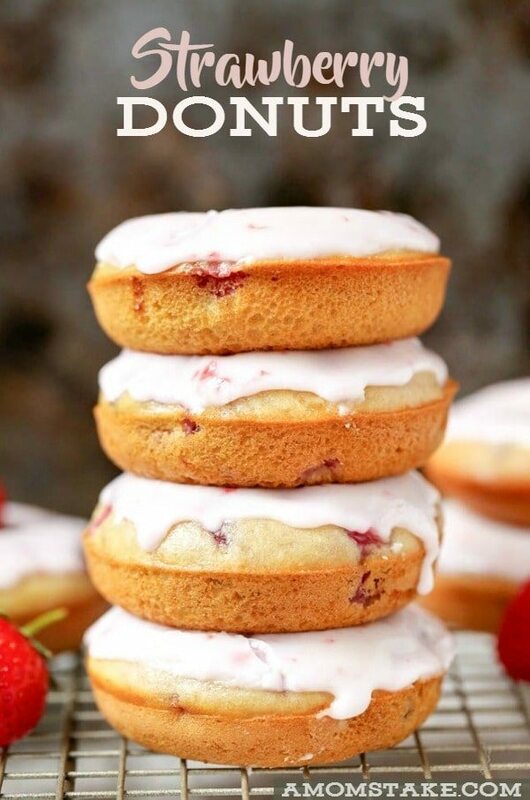 Waking up and having these strawberry donuts waiting for you can’t be beaten. You’ll love the fluffy texture and sweet taste! If you love these super delicious homemade strawberry donuts, you have to give our Monkey Bread Waffles a try! 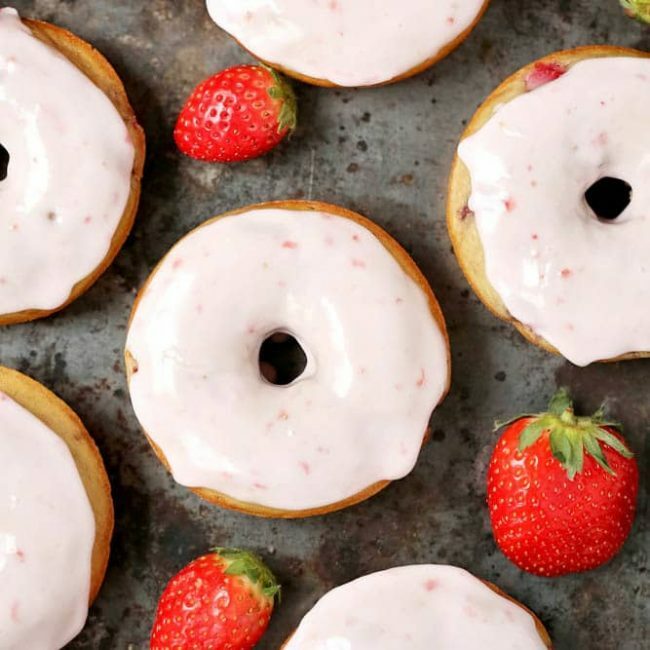 Nothing says good morning quite like these sweet, fruit-filled strawberry icing donuts. 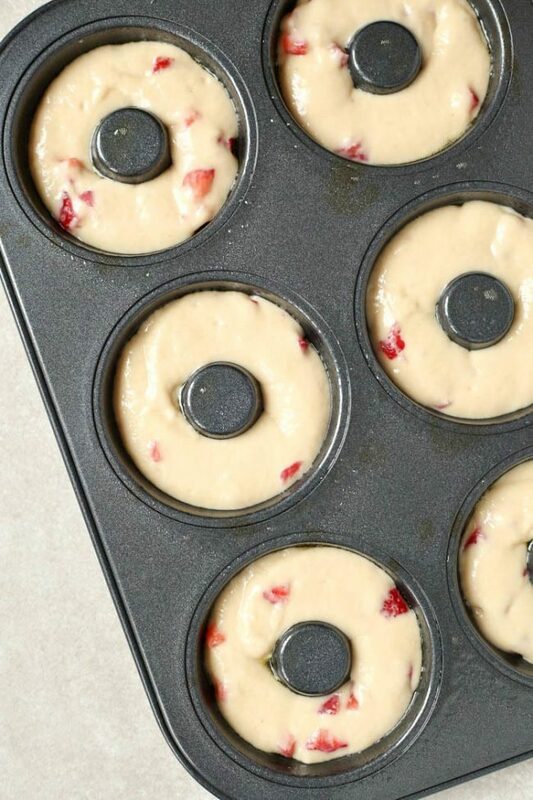 This simple strawberry donut recipe adds in a mix of fresh diced strawberries that make these donuts so delicious. You can make this recipe in under 20 minutes, including prep and baking time! Heat oven to 350 degrees. Whisk together flour, baking soda, sugar, and salt to mix thoroughly. In a separate bowl, whisk together buttermilk, eggs, coconut oil, and vanilla thoroughly. Pour this mixture into your dry mix bowl, stir until just combined, then fold in your strawberries. Pour your completed batter into a zip top bag and seal. Cut off a large corner. Spray a donut pan with nonstick and then pipe your batter into it, making sure it is just level with the pan but doesn’t spill out over. Bake for 12 minutes, then cool on a wire rack. 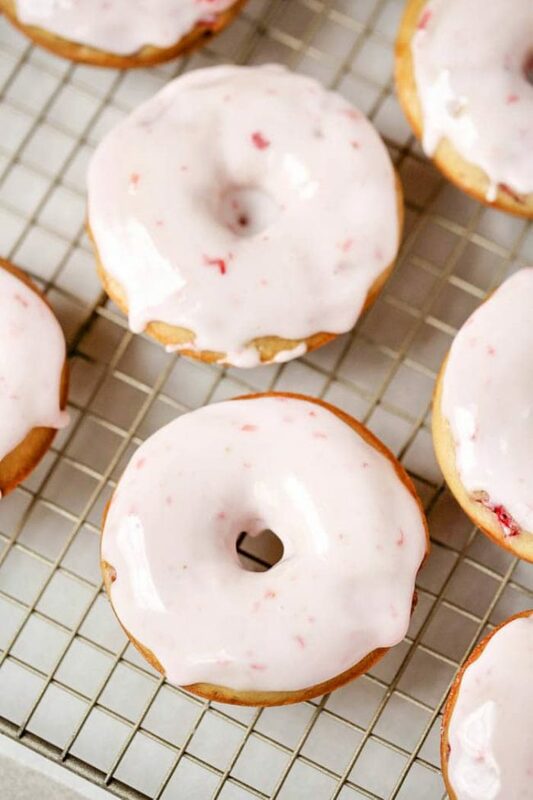 When donuts are completely cooled, dip one side of each into your strawberry icing and set aside to harden. 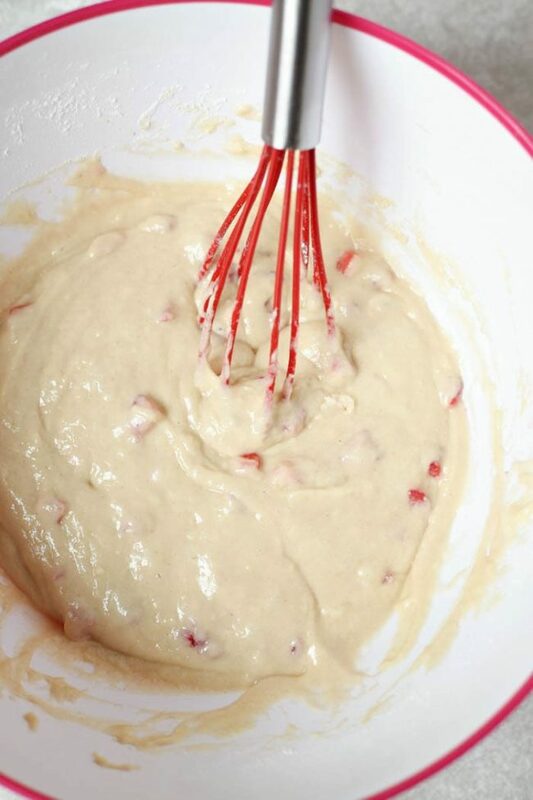 To make, whisk all ingredients together until smooth. These sweet donuts are as yummy as they are pretty. They will be a perfect morning treat to surprise your whole crew with. Serve with a side of fresh diced fruit and a glass of milk for a perfect breakfast or brunch! 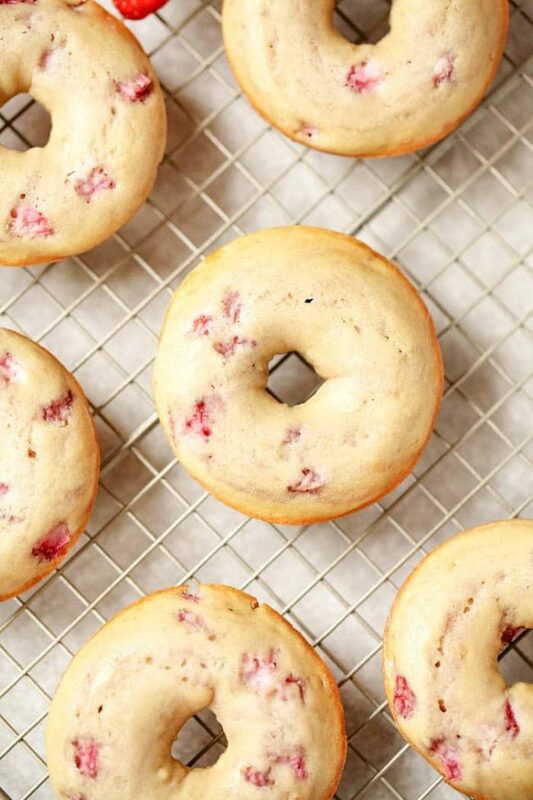 Q: Can you use frozen strawberries for this strawberry donut recipe? A: While you can use frozen, it can make the batter become to thin due to the excess liquid of the strawberry when unthawing. Q: How can I cut down on the sugar content in this strawberry frosted donut? A: If you can leave off the frosting, that will take away a lot of the sugar. Q: How long will this strawberry frosted donut stay fresh? A: If you aren’t able to eat them in one sitting, eating them within the next 24 hours will be the best way to keep them fresh. 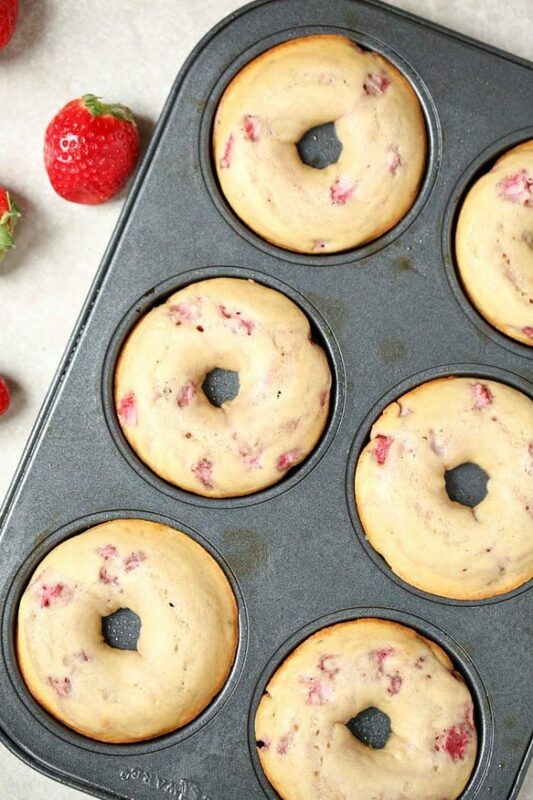 IF YOU LOVE THESE STRAWBERRY DONUTS, SPEND A FEW MINUTES TO SEE THESE OTHER BREAKFAST RECIPES THAT WILL BE AN AMAZING PART OF YOUR RECIPE COLLECTION! In a separate bowl, whisk together buttermilk, oil, vanilla, and eggs thoroughly. When donuts are completely cooled, dip one side of each into your icing and set aside to harden. 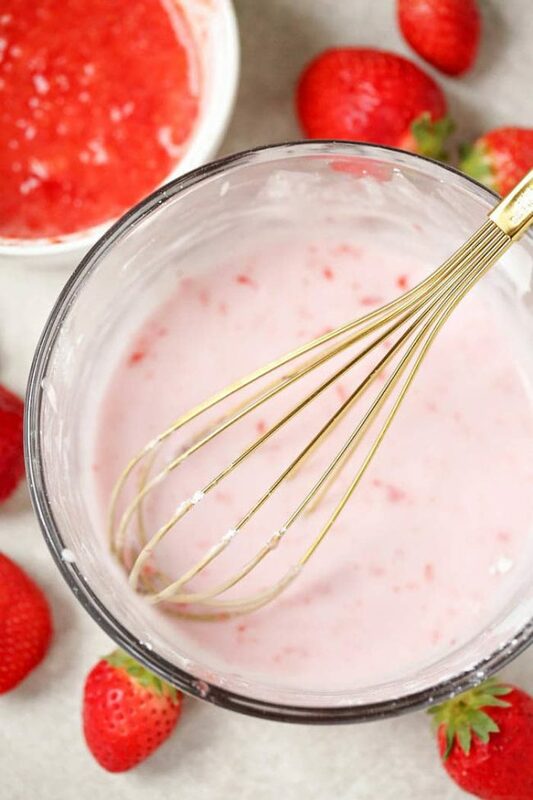 To make the strawberry icing, whisk powdered sugar, milk, and strawberry puree together until smooth. I’ve never tried to make homemade donuts via baking. My recipes always had them fried in oil. These would be just a bit healthier! Yum, those sound delicious! My Grandma always made homemade donuts. These would be a great thing to make with my daughters. These look so delicious! And using my favorite fruit is the icing (ha ha ha!) on the donut! I still haven’t managed to make a batch of donuts even though I’ve been wanting to forever. This may be the push that I need. We love baked donuts and this recipe looks delicious — I’m bookmarking it so we can try next time we’re in the mood! Yum! These strawberry donuts are making me super hungry! They look so delicious! My daughter loves strawberries and is going to inhale these when I make them! I like the way these look and I bet they are amazing. I will have to look for one of these pans, they are sure easier looking than the frying method! Love the frosting too I bet these would work well for Easter. I really love this recipe! I never saw a pan like that, certainly would make these a lot using that pan! 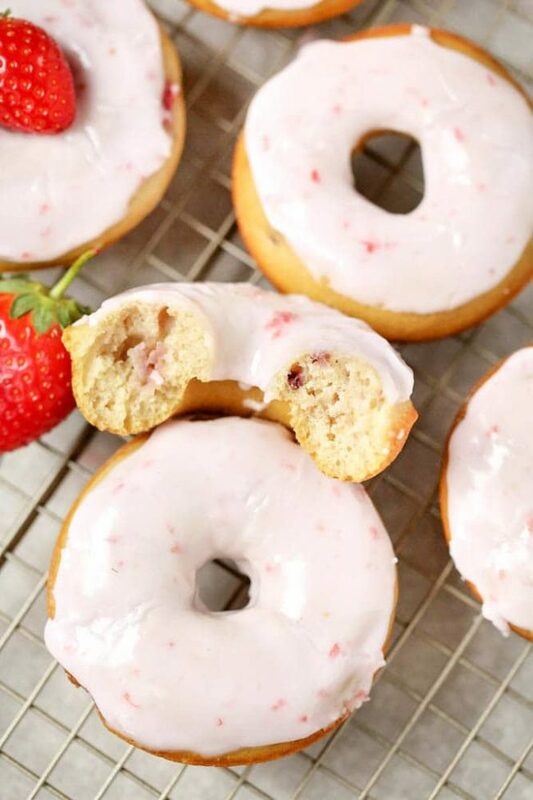 These strawberry donuts look so good! And they are so easy!! You always share the best recipes!!! Ive never tried to make my own donut. These look too good to pass up. I can’t wait to give them a try. I love strawberries. These look so good! These look so good. I want to try them. wow this is actually a do-able recipe. It doesn’t require yeast , or frying donuts. I’d love to try these, they would be so fresh and delicious. Oh wow, these look amazing! I have never tried to make donuts at home, I keep saying I want to try. I really want to try these…I need to pick up one of those pants!